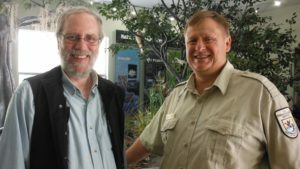 Rolf Olson, Refuge Manager, Mark Musaus, former Refuge Manager, and Elinor Williams, president, Friends of the Arthur R. Marshall Loxahatchee National Wildlife Refuge, were Rob’s guests. 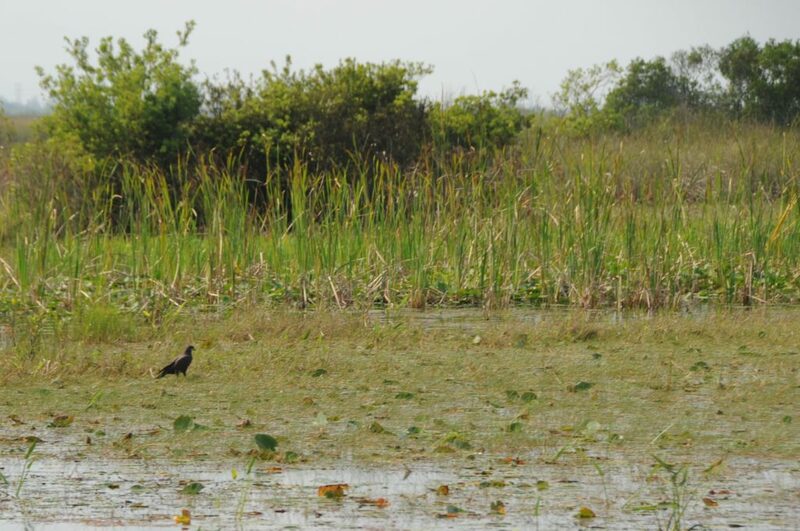 The Loxahatchee is an awesome threshold brimming with wildlife between Lake Okeechobee, agricultural lands, and pine flatwoods to the north and the Everglades to the south, partially bounded by the largest remaining remnant of a cypress strand. An invasive plant, Old World climbing fern, impacts 72% of the refuge. This tenacious vine with 100-foot-long tendrils kills plants by either blocking out light or by causing trees and other native plants to collapse under the weight. Aerial spraying is being done on tree islands where the fern is so thick that it is already killing the native trees. However because spraying kills all plants, often the climbing fern stems must be hand-cut. Then the lower portions are sprayed. Crews, brought to each island by air boat, often stand in nearly waist high water. The Refuge is known for having the greatest number of alligators in Florida, not the greatest biomass of alligators, just the greatest number of snapping jaws per square foot. Snakes and insects in abundance further challenge working conditions. Climbing ferns are remarkably quick to release spores and propagate. So quick that the crew must return to the site for the next two years to fully eradicate the ferns. Five or six insects have been identified to eat Climbing ferns in their native soils. They are being researched to keep the ferns at bay provided they only chew on the invasive plant and not others. Collaborative management with the U.S. Fish and Wildlife Service working in partnership with the South Florida Water Management District has failed to eradicate the invasive climbing fern. The federal agency spends $2 million a year, with the state spending approximately the same amount in recent years. This is woefully inadequate. Water quality and the quantity of water flowing into the Everglades are issues no less pressing than is the spread of invasive plants. There is still work to be done by concerned advocates to save the Loxahatchee. Home of the endangered Everglades Snail Kite, Wood Storks, Mottled Duck, White-tailed Deer, Bobcat, Peninsula Cooter and Florida Softshell, the Loxahatchee National Wildlife Refuge is worthy of your attention. Tune in to Moir’s Environmental Dialogues radio for conservation conversation.